THE DISTRICT CELEBRATES 50 YEARS! 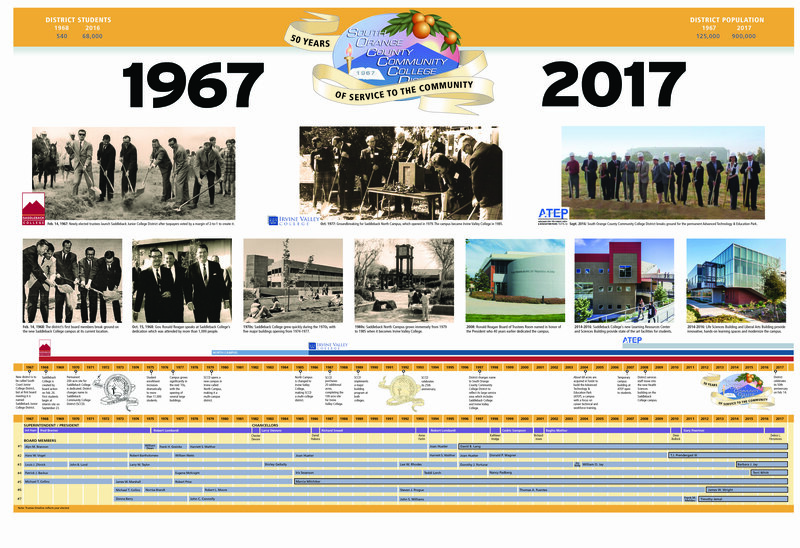 Interim Chancellor Debra Fitzsimons provided highlights of the district's 50 year history and presented a commemorative timeline as a gift to the board of trustees, college presidents, college libraries and district services to mark the district's collective progress. Resolutions were presented from Mayor Don Wagner of Irvine and Mayor Pro Tem Ed Sachs of Mission Viejo; representatives from the legislative offices of Rep. Mimi Walters, Sen. Pat Bates, Sen. John Moorlach, Assm. Steven Choi, and Assm. Matthew Harper; and the Orange County Board of Supervisors. The district also received proclamations from the city of Tustin and Rep. Darrell Issa. The SOCCCD board of trustees passed their own resolution to mark the historic 50th anniversary. 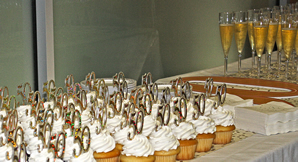 A short reception followed in the foyer featuring cupcakes and sparkling cider. All consent calendar items, general action items, and academic and classified personnel actions with minor revisions to 5.1. Item 6.6 was revised to remove BP-5520 Shower Facilities for Homeless Students and BP-3950 Unmanned Aircraft Systems for further review. For additional information, please contact the Chancellor, College President or appropriate Vice Chancellor. Resolution commemorating SOCCCD's 50 years of service to the community. Nomination of Trustee Milchiker for the Marian Bergeson Award. Curriculum revisions for the 2017-2018 Academic Year at both colleges. Agreement with Alternate Delivery Solutions, LLC to provide Design-Build Consultant Services for the Irvine Valley College Parking Lot Phase IA Project and Solar Shade project for a not to exceed amount of $240,000. Agreement with Alternate Delivery Solutions, LLC, to provide Design-build Consultant Services for the Irvine Valley College Health Center/Concessions project, for a not to exceed amount of $266,000. Saddleback College and Irvine Valley College Audio Visual Consultant Services agreement with PlanNet Consulting, LLC, in the amount of $122,758. Notice of Completion for Saddleback College Wireless Access Point Installation project to T and D Communications for a final contract amount of $99,990.99. Notice of Completion for Saddleback College Roof Numbering System project to Bravo Sign & Design, Inc., for a final contract amount of $97,465. Community Education courses, presenters, and compensation for Summer Session 2017 for both colleges. Three design-build firms for the SOCCCD Design-Build Consultant Services Pool, for no greater than a five year period. Agreement with Vicenti, Lloyd & Stutzman LLP to perform the District’s financial audit for the term of June 30, 2017 to June 30, 2019 for an amount not to exceed $398,400 and an optional two (2) one-year renewals. Accept Nyhart Company’s 2017 Retiree OPEB Trust Actuary Report and Recommended Funding and allocate $4.6 million to fund the normal cost for FY 2017-2018. Approve student out of state travel. Adopt Resolution No. 17-04 declaring SOCCCD’s intention to enter into a Grant of Easements agreement with Irvine Ranch Water District at ATEP County of Orange Land Exchange and to conduct a public hearing on March 27, 2017. Resolution No. 17-05 declaring SOCCCD’s intention to enter into a Grant of Easement agreement with Southern California Edison at the ATEP site and to conduct a public hearing on March 27, 2017. Change Order No. 1 for the ATEP Site Utilities and Infrastructure Phase I project with Griffith Company, resulting in an increase of $188,686, for a revised contract amount of $5,542,436. Update Authorized Signature List of Board of Trustees’ Designees to Approve Documents and Contracts. BP-4203 Sick Leave for Educational Administrators and Classified Management Personnel, BP-5515 Transfer Center, and BP-4119 Academic Ranking. Amendment to 2017-2018 Tenure-Track Faculty Hiring Authorization at Saddleback College. Annual Reports on Probationary Faculty Recommended for Continuation of Tenure-Track Status. Trustee Whitt attended a faculty art and photo exhibit at Saddleback and she was fascinated with their creative process. She will attend an upcoming OCSBA session to learn about what's happening at the state level for K-12. Trustee Milchiker provided an update from the Orange County Community Colleges Legislative Task Force. The group is reviewing a list of 59 federal regulations identified for possible cuts. State advocacy continues for an increase in the Prop. 98 split at the May Revise if revenues increase. Other advocacy topics include a mental health bill with possible tie-in for student veterans, health centers, and homelessness on campuses; and continued monitoring of state vs. federal legislation related to undocumented students and DACA. She attended a debate at IVC which hosted a team from China; Astounding Inventions; and a STEM forum at SC. Trustee Lang thanked the legislative offices for attending the district's 50th anniversary celebration and their thoughtful proclamations and recognitions. Trustee Wright attended the final President's Cup game; the SC President's classified staff luncheon; the District audit committee; and a special board meeting to discuss the board's role in accreditation. The board leadership had a positive meeting with the accreditation visiting team on Monday. Trustee Jemal attended Astounding Inventions and congratulated the foundation staff for their hard work on the event. He enjoyed meeting with the accreditation visiting team. He said the Chancellor's search is moving along the timeline as planned. He interviewed on Laguna Woods TV Channel 6 and highlighted the strength of our Emeritus programs and importance of lifelong learning. He recently met with the SC Foundation leadership to offer support in the community. Trustee Prendergast attended the President's Cup game and the Globetrotters event at SC. He especially enjoyed watching the kids at that event. He will attend the OCSBA meeting and is looking forward to a presentation on the unified school districts' plan to collectively launch a satellite. Student Trustee Forde welcomed the student trustee from Long Beach College who attended our board meeting. He called attention to student equity issues with respect to how students are receiving information. Interim Chancellor Debra Fitzsimons said the district was pleased to host the visiting team for accreditation with many meetings throughout the day and week. She welcomed some of the team members to the board meeting. She reiterated that nothing is more important that our accreditation and thanked the numerous faculty, staff and administrators district-wide for working collaboratively on this effort. She called attention to the evening's discussion item and event commemorating the district's 50 years of service to the community. She thanked special guests including elected officials from cities and representatives from state and federal legislative offices for their attendance and thoughtful recognition. She invited everyone to join the special reception during a short break in the meeting. Saddleback College - President Tod Burnett's written report included: The Association of Community Colleges and Junior Colleges (ACCJC) visiting team started visiting Saddleback College on Monday, February 27th and will continue through Thursday, March 2nd. The visiting team, comprised of peer faculty, staff, management, and trustees, comes to the campus to evaluate the college's accreditation status. We are fully committed to the accreditation process and welcome the opportunity to evaluate our progress since the last ACCJC team visit in 2010. Thank you to our accreditation tri-chairs: Dr. Juan Avalos, Dr. Bob Cosgrove, and Craig Connor, and the dozens of employees who have dedicated considerable time to our accreditation self-study and the ACCJC team visit. President Burnett held a president's chat on Tuesday, February 14th, where he answered questions and discussed the ACCJC team visit. The classified staff luncheon was held on Friday, February 3rd. Thank you to Trustees Wright and Milchiker for attending. The presentation focused on One Book One College, CTE Career Pathways, student mental health issues, accreditation and more. Joey Sellers' Jazz Studies Program commemorated Jazz Day on February 25th with a full day of jazz activities which included clinics with high school ensembles, a meet-the-artist session, and a master class leading to a concert by Saxophonist/Composer Walter Smith III and the Saddleback Big Band in the McKinney Theatre. Irvine Valley College - President Glenn Roquemore’s written report included: Members of Irvine Valley College (IVC) and Chapman University met to sign a new Transfer Agreement Guarantee (TAG). Students studying biochemistry and molecular biology, biological sciences, chemistry, computer information systems, computer science, environmental science and policy, French, health sciences, Japanese, kinesiology, math, physics and computation sciences, psychology, software engineering, or Spanish will be considered for transfer to Chapman following the admission requirements set forth by the agreement. Vice President for Student Services Linda Fontanilla led a team of 13 IVC representatives at the Institutional Effectiveness Partnership Initiative (IEPI) Pathways Training Workshops in Costa Mesa, CA. The workshops were designed for college leadership teams interested in learning about different strategies to implement a college pathways approach. On January 28, young inventors from kindergarten through eighth grade competed at the 30th Annual IVC "Astounding Inventions" competition. The inventions were grouped by grade level and judged on their originality, usefulness, and a written description and illustration submitted by the student. Over sixty judges representing the scientific, education, civic and business communities determined the winners at the event. In addition, as part of its title sponsorship, Knobbe Martens selected two students' inventions from the event (one from Irvine Unified School District and one from Tustin Unified School District). Business Services - Interim Vice Chancellor C.M. Brahmbhatt's written report included: A bid was awarded for the South Orange County Community College District (SOCCCD) and California State University, Northridge (CSUN) business plan for a KCSN/KSBR Radio Station Collaboration. A finalized agreement will be presented to the SOCCCD Board of Trustees at the June 26, 2017 board meeting. The board meeting may be viewed online at www.socccd.edu. Television broadcasts are scheduled for 7 pm on Friday, March 3 and Saturday, March 4 on SC Channel 39 and IVC Channel 33. SC TV 39 has an additional broadcast on Sunday, March 5 at 7 pm.